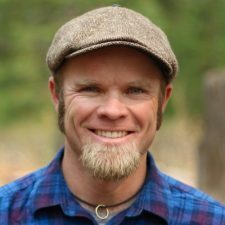 This expedition includes an experienced Western guide. 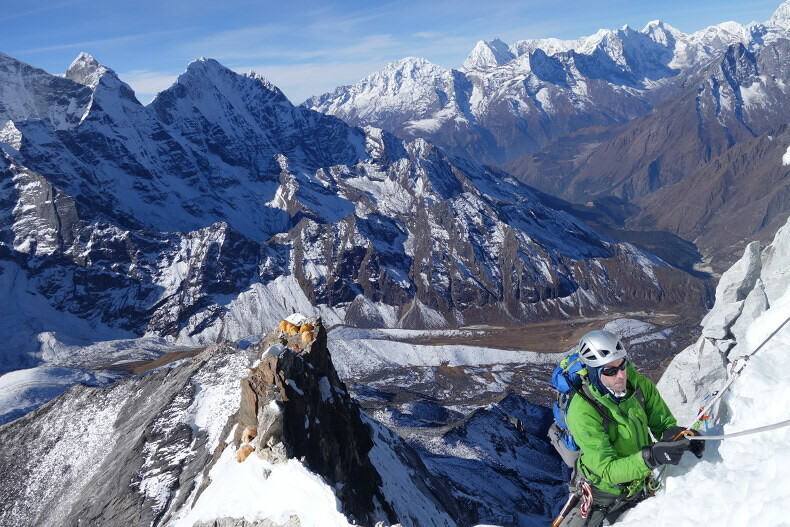 Ama Dablam is an ideal stepping stone to more independent expeditions on big Himalayan peaks. You'll climb the route of the mountain’s first ascent, the Southwest Ridge and be supported by the best Sherpa staff in the Khumbu. Climber to guide ratio is 4:1, and our climber to sherpa ratio is 1:1. 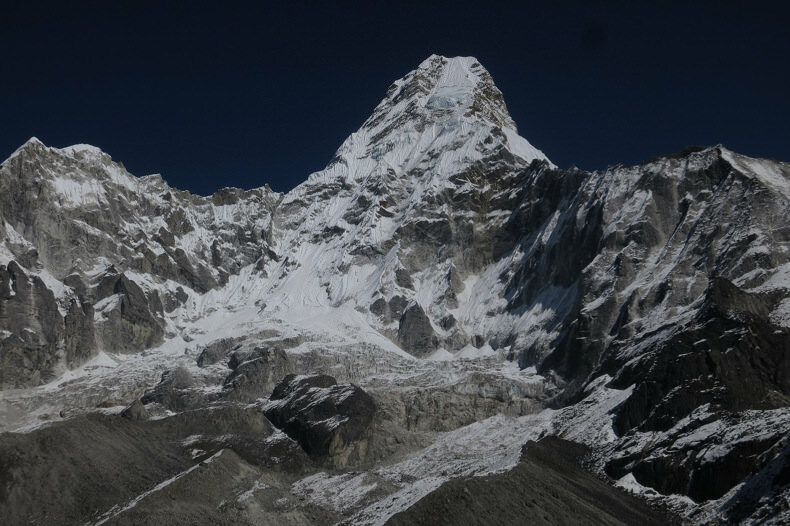 No mountain in the world captures alpine climbers’ imaginations like 22,525 foot (6,866 meter) Ama Dablam. It stands alone in the Solu Khumbu (Everest) valley, towering almost 10,000 feet (3,050 meters) over the famous Sherpa villages of Thyangboche and Pangboche. 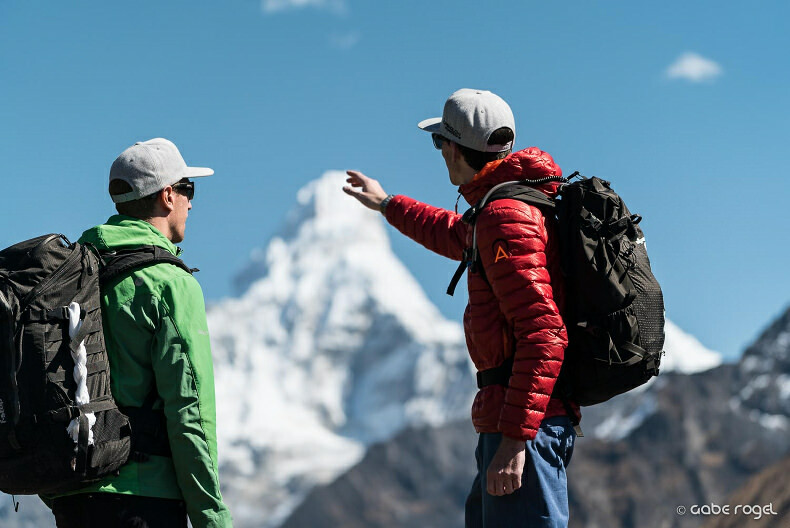 With no easy route to its summit, climbing Ama Dablam is reserved for dedicated alpinists, who have built skills and experience in much more than simply high altitude walking. 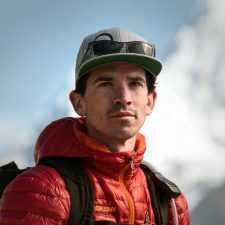 The successful climber will have solid multi-pitch climbing experience on rock and ice, and be comfortable climbing technical terrain with a pack on, taking care of themselves in very high alpine camps, and spending days at a time in exposed terrain. On our expedition we climb the route of the mountain’s first ascent, the Southwest Ridge. First climbed in 1961, the route is incredibly varied. It offers every type of climbing along the way to the summit, and from Camp 1 up is always exposed and technical. 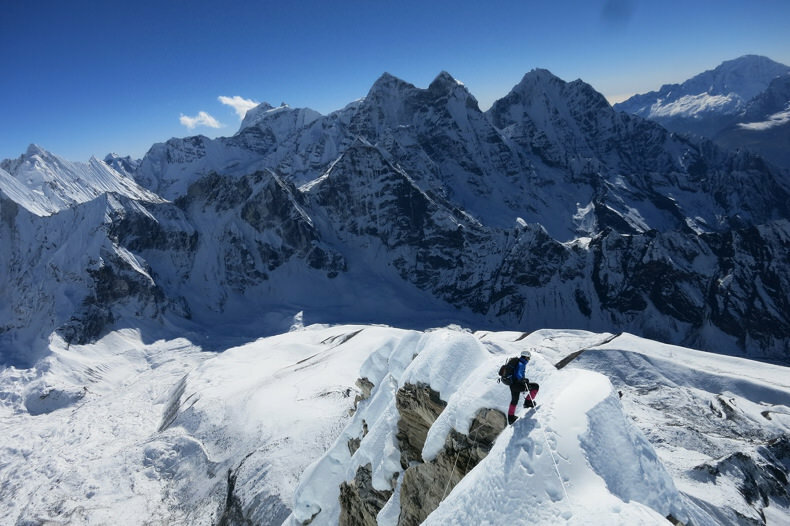 An expedition to Ama Dablam will test all of your mountaineering skills, and a summit is one to be very proud of. Climbing this peak also provides a taste of true Himalayan expedition life. 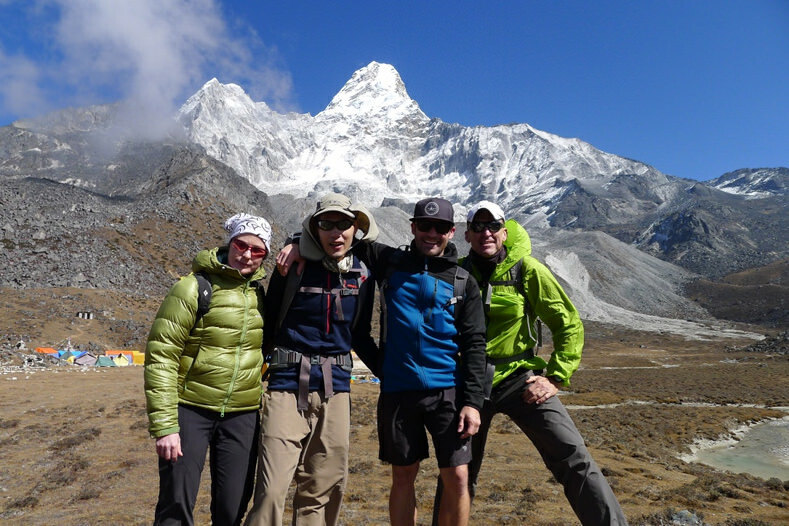 You will be supported by the best Sherpa staff in the Khumbu. After an 8-day trek through the villages of the Everest Valley, we will have a full Puja blessing ceremony, and then settle into life in a very comfortable basecamp, complete with cook, heated dining tent, individual sleeping tents, and a private bathroom tent with shower. We have found that these amenities are essential in having a well-rested and strong team of climbers during our summit push. We pride ourselves in our record of safety and success. Beware of operators who offer Ama Dablam climbs with less support! 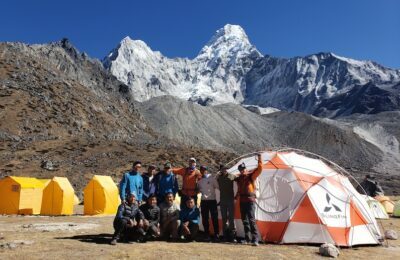 All of our guides and sherpa have summited Ama Dablam and other Himalayan peaks countless times. 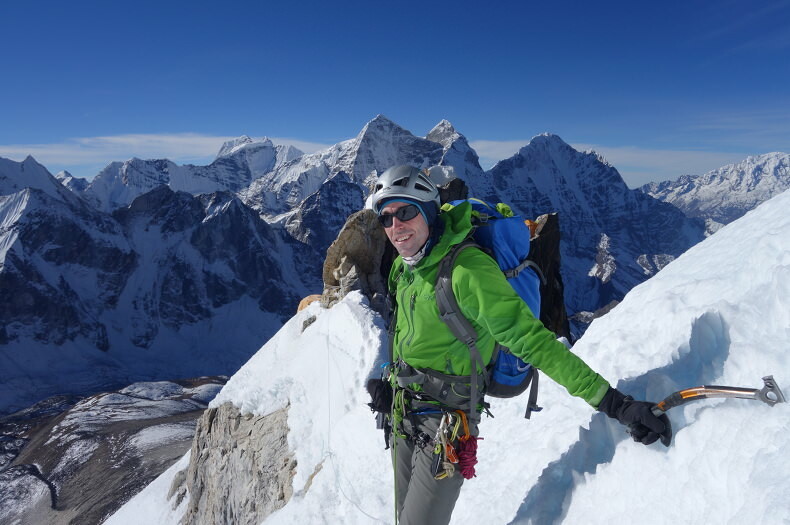 This maximizes your safety and your opportunity to climb Ama Dablam successfully. We combine our western guides’ and sherpa’s experience with the local expertise of one of Nepal’s best logistics operators, and the services of our good friend and local sirdar/guide, Dorji Sonam Sherpa. Dorji hails from the beautiful town of Phortse, and along with at least 6 ascents of Ama Dablam, he has summited Everest 15 times. 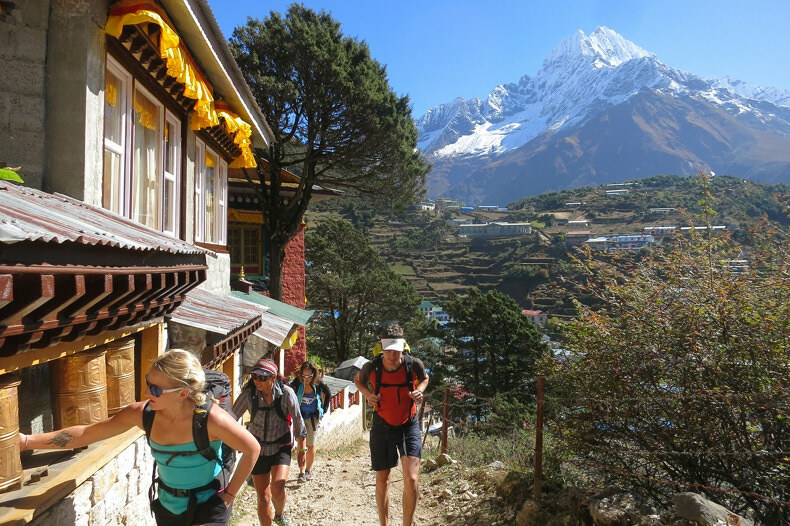 His management of our local staff, knowledge of the Khumbu, and friendly personality will be essential in ensuring that you stay healthy, strong, and able to enjoy each component of this experience. 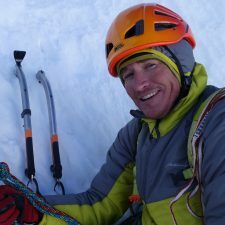 Climbers should have experience multi-pitch climbing (rock or ice), be comfortable following grade 4 ice climbs, 5.9 rock climbs, and have climbed at altitude (over 18,000 feet). We transfer to our hotel and begin the process of getting over jetlag. (Monday). Today we explore some of Kathmandu's most famous sites. These include Swyambunath (the Monkey Temple), Pashupati (Nepal's largest Hindu temple), Boudanath (Kathmandu's most important Buddhist temple) and the old city's original central square, Durbar. We also have our first team meeting and organize our bags for the trek. 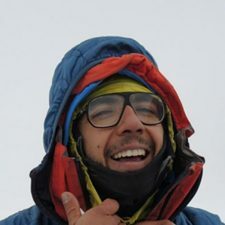 Trek Lukla to Monjo (9,300 feet / 2,835 meters), 4-5 hours. One of the most beautiful and memorable mountain flights in the world, our 45-minute flight takes us from Kathmandu to Lukla, the town where we begin our trek to base camp. After organizing our yaks and porters we begin our trek to base camp. After organizing our yaks and porters we begin our hike to the town of Monjo. 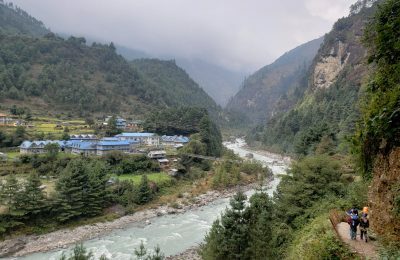 The trail is excellent, and after descending to the town of Phakding, it climbs easily from the river and across our first suspension bridges up to our lodge in Monjo. Today we split with our support trek group. As they head up the valley to Lobuche, we choose a backcountry route away from the tourist trail, traveling through tiny yak herder settlements and over countless moraines as we circle around the base of Ama Dablam. Base camp sits in a beautiful grassy valley immediately at the base of the mountain’s West Face, and we arrive there in time for lunch. After lunch we spend the afternoon settling into base camp and getting our gear organized. After a big breakfast we begin hiking along a morainal ridge with spectacular views of the mountain. We eventually join the beginning of the Southwest Ridge, at this point a large plateau, and follow it thirty minutes or so to our tents. After a quick break and leaving some equipment, we return to base camp. We begin our day with a Puja, a Buddhist blessing ceremony. This is a meaningful ritual for our Sherpa prior to the beginning of every expedition, and a special ceremony to take part in. We will spend the rest of the day organizing equipment, eating, taking showers, and visiting other teams from around the world. This second rest day is crucial for our bodies to recuperate from many days of trekking at altitude. It is also a busy day. We set up a long and complicated fixed-line practice course on the cliffs and rocks above our base camp. We spend half the day practicing all the skills we will need on the technical sections of Ama Dablam including jumaring vertical lines, technical traverses, rappelling, arm-wrapping, and analyzing anchors and ropes. We hike to Yak Camp, this time to sleep for the night. Today we get our first taste of technical climbing on the mountain. We will clip into the fixed ropes and climb to Camp 2, dropping a small load there. The climbing is incredible, with short steps of 5.6-5.8 climbing interspersed with countless fourth to easy fifth class moves. The crux pitch of the climb, the Yellow Tower, is also found here. We return to Camp 1 to sleep. We wake up early and have a quick snack and hot drink. The descent from Camp 1 goes slowly down the technical slabs and across the talus, but then very quickly down the good trails from Yak Camp to base camp. We leave any gear we can at Camp 1 and Yak Camp in preparation for our summit bid. We will have earned it! 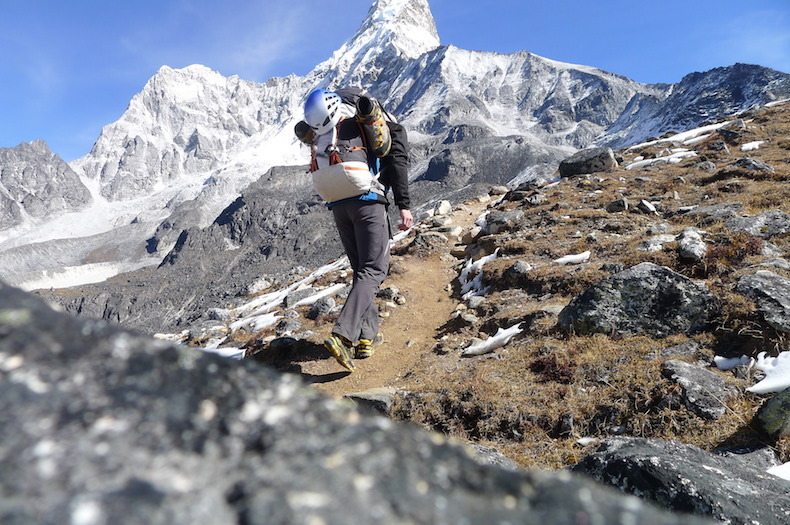 Our bodies need to be 100% before attempting our summit of Ama Dablam. In base camp we eat great food, write emails home, play cards, hydrate, and sit in the sun. 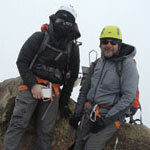 At this point we are also carefully analyzing the weather forecasts, choosing our best days to go for the summit. Today is the beginning of our summit push, and we take our time moving to Camp 1, climbing as efficiently as we can to conserve our strength for the upcoming days. After repeating the fun rock climbing from Camp 1 to Camp 2, we continue on to new terrain. The climb from Camp 2 to Camp 2.7 is mostly ice and mixed climbing, and includes some of the toughest pitches of the whole climb, including the steep and difficult Grey Tower. Just before reaching Camp 2.7 we cross the mushroom ridge, a series of cornices and ice sculptures glued precipitously onto a knife-edge rock ridge. It is a section of climbing you will never forget! We build Camp 2.7 on the Mushroom Ridge in order to avoid any serac (icefall) danger from the Dablam that has endangered the traditional Camp 3 in previous years. Any energy left from the climb and descent will be used to celebrate our summit push and safe return! After our summit push we will need and deserve this rest day. We organize gear, hang out in the sun, and feast on the kitchen’s creations. To be used as needed on our climb. This 45-minute flight begins with one of the most exciting takeoffs in the world. Once airborne the flight offers incredible views of the mountains, the foothills, and finally the city. After landing in Kathmandu we return to our hotel for an afternoon of celebration, great food, and perhaps much needed massages. Night in hotel. Since the flights to and from Lukla are often delayed or cancelled due to bad weather in the mountains, this is an essential extra day. If we arrived back in Kathmandu on time, this day can be used for sightseeing in the city, shopping for souvenirs, or sleeping in and enjoying the fantastic pool at the hotel. Your longest, most difficult day will be summit day. We wake very early in the morning, using headlamps and warm layers. Climbing steadily through the night, we find ourselves high in the peak when the sun rises. After gaining the summit, we descend back to 2.7 camp, or back to camp 1. You can expect between 12 and 15 hours of steady movement. Do you rent gear for Ama Dablam? At 6,812 meters (22,349’), Ama Dablam will give you the necessary altitude experience to attempt the bigger mountains in the world, such as Mt. Cho Oyu in the Himalaya.